Craft Away! | Creative project ideas, tips, and inspiration for the DIY crafter who doesn't want to break the bank. Creative project ideas, tips, and inspiration for the DIY crafter who doesn't want to break the bank. As many of you know, St. Patrick’s Day is coming up soon! So I found a lovely craft project that is easy and cheap to make, and will liven up your holiday spirit. Rook No. 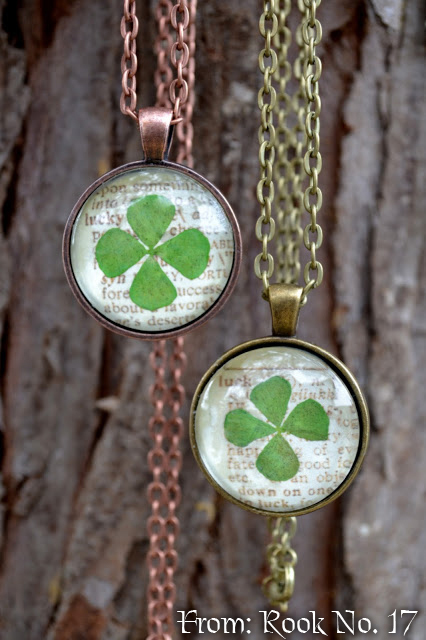 17 shows you how to make a lucky clover pendant necklace in hardly no time at all. I love this craft idea and cannot wait to make it! So if you want to get into some classy St. Patrick’s Day cheer, I definitely recommend this project! I was looking for some more fun and easy craft ideas when I came across this tutorial on YouTube by FaveCraftsVideos that shows you how to color glass jars. I love this idea, and I also love that it is non-toxic and dishwasher safe! Just follow the easy directions given in the video, and you will soon have beautiful colored glass jars. I apologize for the long break we had there. Sometimes unforeseen events arise in life. That being said, this blog was originally started as a semester-long class project. The class has since ended, but I would like to continue making posts. It will probably not be as many posts a week as the class had required, but I still want to share craft tips and ideas with you! 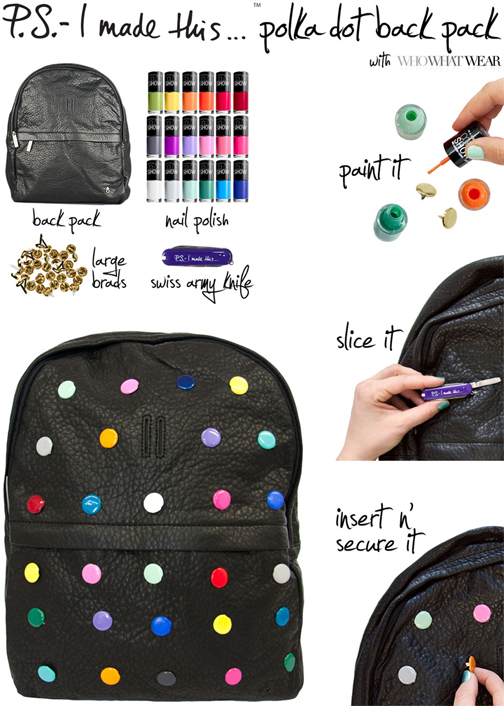 So, this idea from P.S.- I made this… has inspired me to start my posts again with this creative idea of a colorful polka dot back pack that you can easily make on your own. I really love the idea of using nail polish for projects like this. P.S.- I made this… also mentions that you should put a little bit of glue on the back of the brads to help them stay securely fastened to the back pack. One of my go-to craft glues is E-6000. I highly recommend this one! It has so many uses and can be applied to a variety of different surfaces. I was looking for some more easy DIY Christmas ornament ideas when I came across this video posted by stampwithtami on YouTube. They show you how to make a beautiful pop-up Christmas ornament that looks somewhat complex at first glance, but is actually easy to make! I really love this idea and cannot wait to try it out! As you can tell, I have been in the holiday mood lately. And going along with that mood, I found some easy Christmas cupcake decorating tutorials posted by MyCupcakeaddiction over on YouTube. The two videos I wanted to share show you how to easily create Christmas tree cupcakes, and Rudolph the Red Nosed Reindeer cupcakes. I personally like the Rudolph cupcakes better. (They are so cute!) But what is Christmas without a Christmas tree? So I hope you like these videos, or at least feel inspired to make your own Christmas cupcake creation. Not too long ago I made a post about upcycling a serving platter with a fall theme. A reader wanted to see more of this style, but with a Christmas theme to it. Well, I finally found one that I thought was worth posting about. Stay at Home-ista has made a post that shows how they upcycled a cookie platter using a Christmas theme. This uses the same painting method as the fall serving platter upcycle, but with some Christmas flair. Please note that Stay at Home-ista did not mention that you either have to let the paint dry for a certain amount of time, or bake it in the oven to set it. Just make sure that you read all of the directions on the paint you choose to use before starting. Another important point to note is that this paint is NOT food safe. So make sure that when you paint your dishware, the paint is on the outside, or in an area where your food will not come into contact with it. I was recently at Jo-Ann’s and saw this flyer about making zipper tree ornaments. I automatically thought of posting it to this craft blog. But for those of you who are interested in learning how to make these zipper tree ornaments, but will not be able to attend the lesson at a Jo-Ann store, I found their video posted on YouTube. They also posted a PDF that includes a list of directions and supplies.